Chrome has overtaken second place in the browser wars, but still lags behind Internet Explorer. Back when I was a wee lad, there was only one way to get "on the lines." You clicked (doubly!) on the little nautical wheel and booted up Netscape Navigator. Then Microsoft beat away its cute and fuzzy competitors with the Internet Explorer club, and like everyone else, I pretty much used it for years. Firefox was a breath of fresh air in the early 2000s for me, but even that noble browser began to slow from the ballast pulling it down. I tried Google Chrome on a whim in 2008 and I never went back. 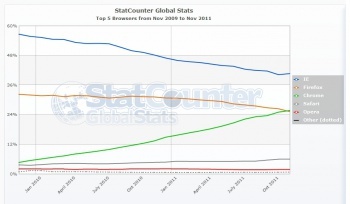 Its growth in usership was part of the uncrowning of Internet Explorer as the browser used by more than half of the world, and now, according to Statscounter.com, usage of Chrome has overtaken that of Mozilla's Firefox to rest firmly in second place. Well, perhaps not exactly firmly. Chrome holds a slim lead with 25.69 percent of internet denizens using Google's slim browser, while Firefox is used by 25.23 percent - a difference of just .46 percent for those of you too lazy to pop open a calculator. Sadly, Internet Explorer is still used by the most people with 40.63 percent, mostly due to old installs of Internet Explorer 6 on machines in nursing homes in Minnesota, I suspect. These people just don't want to upgrade, despite Microsoft asking them quite nicely to do so. I have to say that I'm glad more people have adopted Chrome. I really find it to be the fastest and most updated browser I've ever used, and the moveable tabs lining the top of the screen are just as convenient as they were when I first downloaded it. How good is Chrome's design? Well, if both IE and Firefox are aping it, then the Google Chrome team must be on to something. Now if I could only figure out how those Google Chrome netbooks are supposed to work. It's an operating system inside of a browser ... We have to go deeper.